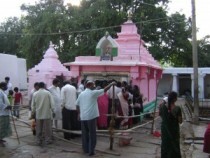 A Kannada television channel telecast, in 2007, a sensational documentary on a Shiva temple (Halu Rameshwara) in Karnataka. 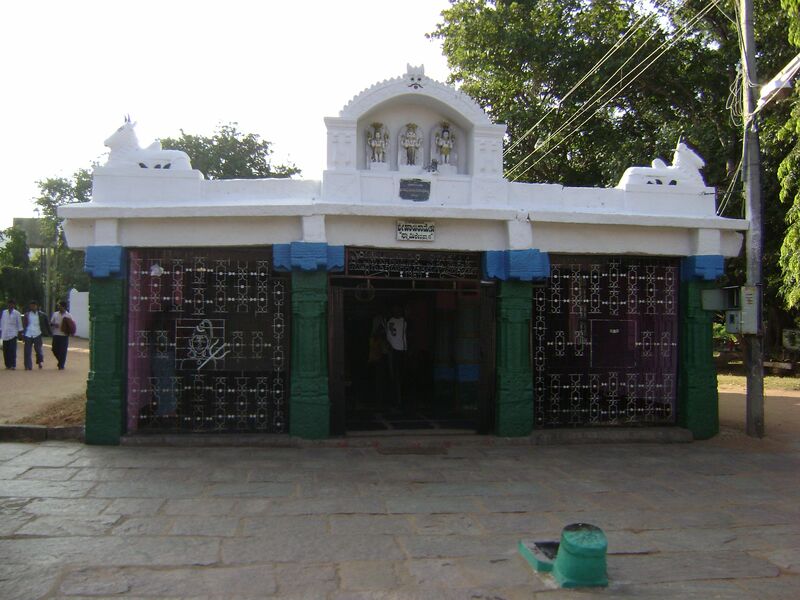 Located at Hosadurga in Chitradurga district, this nondescript temple has, according to the television anchor, a “Wishing-Well” from which miraculously pop up everyday articles and eatables such as banana, rice (including well-cooked curd-rice! ), flowers, betel leaves, bangles, coconuts etc appropriate to the wishes made by the devotees. The anchor claimed that this miracle had been taking place for decades but nobody had been able to unravel the mystery behind it. A legend, I came to hear later, is that when the wife of one of the Mysore Maharajas did not beget a child even after years of wedlock, she visited the temple and performed a puja in the temple. At no time, a miniature replica of a cradle popped up from deep inside the well! Soon the Maharani gave birth to a baby! Recently I got a chance to visit this temple. I was in Chitradurga as part of my official duty. As I have a passion for traveling, I make use of the evenings and holidays during my official tours to visit nearby tourist locations and historically important places. When I asked Pradeep, my colleague in our Chitradurga office, about the places of interest in and around the town, he first listed a series of well-trodden tourist locations such as Chitradurga fort (a magnificent structure indeed), Chandravalli caves, Jogimati Hill Station, etc. In addition, he also happened to mention, perhaps knowing my special interest in things called “miracles”, this temple at Hosadurga and its miraculous wishing-well. It was he who first told me about the television documentary. He also offered to take us (myself and Ravishankar, my colleague from Bangalore) to the temple. Seeing a golden chance to see a “miracle” in person, we grabbed the opportunity. On 16 December 2007, a Saturday, we left Chitradurga in the early hours. Hosadurga, a small panchayat town, is only a three hour journey (by car) from here. When we reached Hosadurga, Balraj, our colleague, was waiting for us. Being a resident of Hosadurga and a very good host, he was to take us to the temple. After having a delicious breakfast at his house, we left the town. Since all the three of my colleagues are persons with a religious bend of mind, they decided to visit first yet another prominent temple in the nearby village called Gavirangapura. 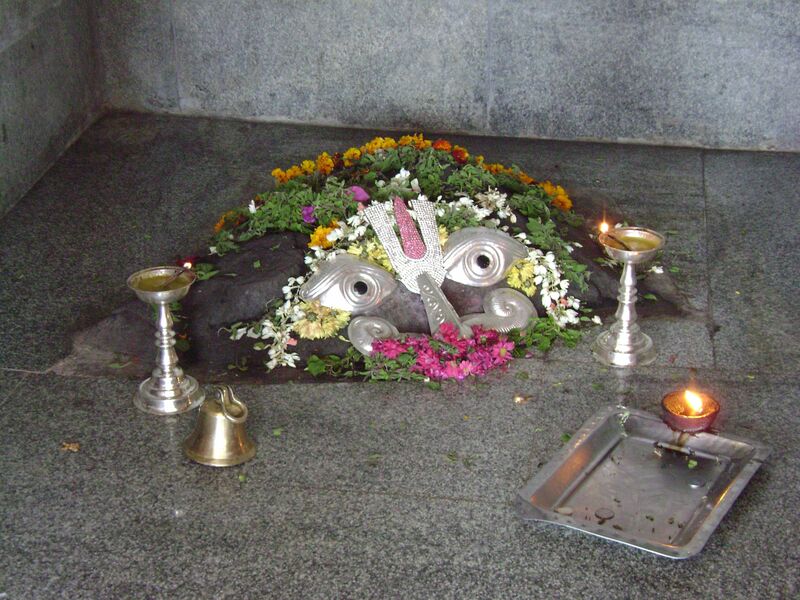 The temple’s presiding deity is a tortoise (Kurma avatar of Maha Vishnu). 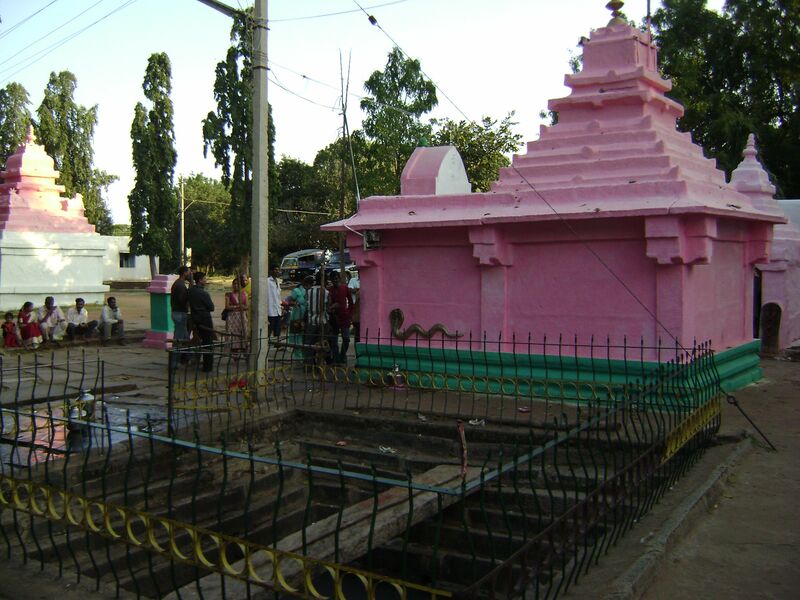 This is one of the only two temples (in the whole of India) where the tortoise incarnationof Vishnu is worshipped, the other one being located somewhere in Andhra Pradesh. The goddess with two sets mammary glands! 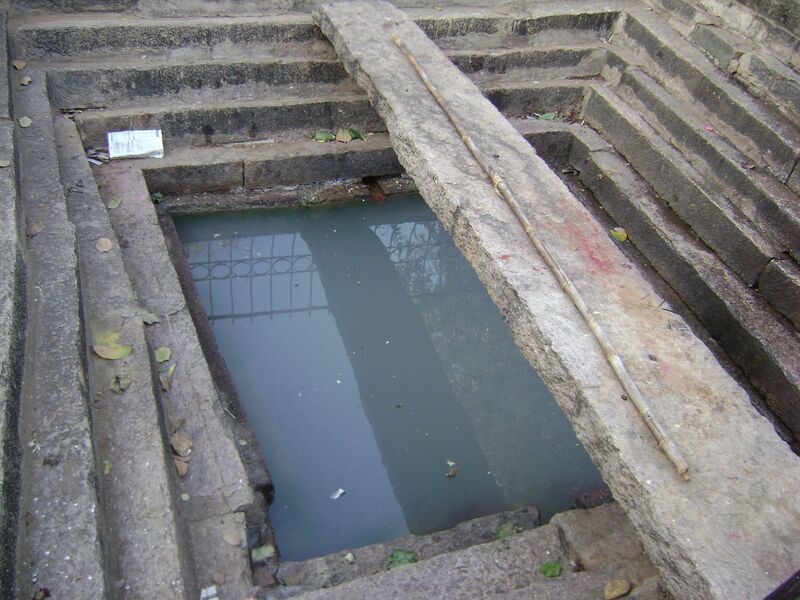 We are side-tracking; it is now time for us to get back to our main topic – Halurameshwara and its Wishing-well. We left Gavirangapura at about 1.45 pm. We finished our lunch at a road-side restaurant (dhaba) at Hosadurga. When we reached Halurameshwara, it was about 4 O’clock in the evening. We could see a number of vehicles parked outside the temple compound. This temple attracts devotees from various parts of Karnataka, including Bangalore, if one goes by the number plates of the devotees’ vehicles. “Miracle” indeed is a flourishing business here! 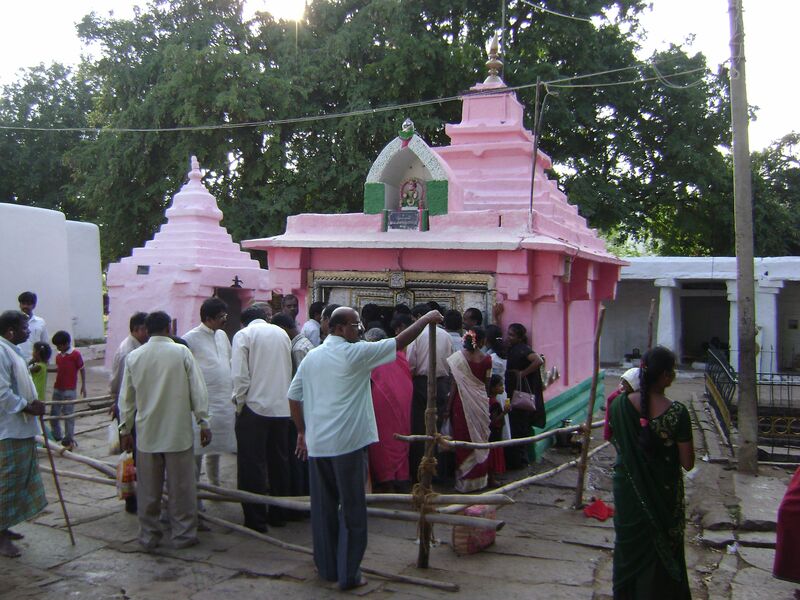 The temple has two structures – the main and the bigger one at the entrance of the temple compound and the smaller one at the back. The wishing-well is inside the smaller structure. Except for two aged women and a temple priest, there was nobody in the main temple at the time of our visit. The centre of attraction undoubtedly was the wishing-well around which we could see a crowd of men and women – young and old – assembled. Everybody was waiting for their turn to witness and be part of the miracle. To witness the miracle, one has to buy a coupon from the office and hand it over to the gatekeeper of the well. The coupons were numbered and the devotees would be called in serial order (unless, of course, you are a VIP) to offer the puja. Balraj bought a coupon for us and we waited for our turn. Since the crowd was reasonably big (though not a huge crowd), I decided to take a walk around the temple as it would take a minimum of one hour for our turn to come. Apart from the light from the oil-lamps and the dim sun light seeping in through the door (there were no windows), there was no light inside. Because of this, the visibility inside the temple was poor. I could notice electric bulbs inside the temple, but they were either switched off or there was no current. 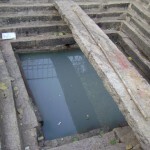 The well (it is more like a small pond) is rectangular in shape. The source of water here is possibly a natural spring inside the well. A two to two and a half feet wide marble stone pavement is done on all four sides of the well. And the walls of the temple are built so close to the pavement that there is not enough space to move around the well freely. Nor is one permitted to do so. One has to climb down a few steps to reach the water level in the well. An idol is kept on a stone beam laid across the well. 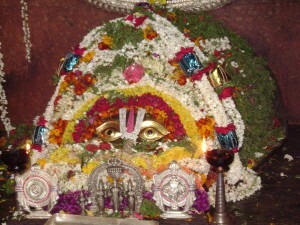 Flowers, bananas, betel leaves etc are also piled up on the beam next to the idol. A priest was sitting on the stone paving on the left. A man in his early twenties was standing in the water on the right. At present a new coupon number is being called and the owner of the coupon shoves his way to the temple. He hands over a coconut, a few ripe bananas and a bunch of flowers to the priest, who keeps the bananas and the flowers on the pavement on his left and then breaks the coconut smashing it on the pavement. The coconut milk and pieces of coconut fall into the well. 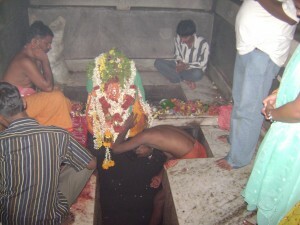 The devotee is asked to perform a puja to the idol. He is then asked to sit on the pavement at the rear-right corner of the pond and pray for his wishes to be fulfilled. (In the meantime a new number is being called and the exercise is repeated). I was expecting that the article would pop up on its own from inside. I could observe nothing of those sorts. (Ravishankar, however, told me later that he did notice a single instance of a piece of banana popping up even when the water was left undisturbed for some time). Instead, the man standing in the pond stirs the water violently with his hand, searches for something, then picks up a torn betel leaf and a piece of crushed banana from somewhere in the pond and hands them over to the devotee. He also does not fail to interpret the “meaning” of the miraculous gift – the betel leaf is an indication that the all the wishes of the devotee would be fulfilled in the near future! This exercise was repeated with a few more devotees, each one getting a betel leaf, flowers, or a piece of crushed (rotten) banana. None of them got a cradle or any other items which would unambiguously symbolize their wishes without the need of an interpreter. Perhaps, one needs to be part of a royal family for the divinity to come out with an unequivocal message! The entire drama was so irksome that I lost interest, yet I decided to wait for our turn to come. We decided that Balraj would offer the puja and I would be the one to accept the miraculous prasad. Our coupon number was called out, Balraj did the puja with all the required devotion, and I went to the rear side of the well to accept the prasad. But it seems we made a mistake. The gatekeeper boy announced that we would not be given the gift, as the denomination of the coupon we had bought was not sufficient for the gift to pop up! It was enough only to perform a mere puja. Unaware of the hike in tariff, Balraj had bought a coupon of lower denomination! I was getting a bit disappointed as I was about to lose a golden chance to observe the drama from close quarters. But Balraj, an seasoned marketing professional and a local heavyweight, was not the one to give up so easily. He asked me to wait and demanded the man, the prasad-picker: “Hey, look, we are local persons, get the prasad!” Realizing the futility of arguing with Balraj, he bends, stirs the water and, lo, picks up a fully peeled and crushed banana! Persistence pays! While handing over the banana, he did not forget to tell me to take that home and perform a puja to fulfill my wishes! This divine interpreter did not have a clue that my wish had just been fulfilled – a pseudo-miracle had just a moment ago got exposed! 1. Why did the omnipotent and omnipresent god decide to manifest himself/herself/itself through a miracle specifically at this place and nowhere else? 2. How authentic is the information related to the visit of the MysoreMaharani to this temple? Doest it belong to the category of an urban legend? 3. If one assumes that this information related to the Maharani’s visit is correct, one should ask: What made the temple deity to bring forth a miniature cradle for the queen, whereas the lay persons had to satisfy with flowers, betel leaves and rotten bananas? Why did the god have a preference for the Maharani over laypersons? Would it not have been a better and a convenient (for the Maharani at least) miracle, had a baby itself popped up from the well!? 4. Why did the person who picks up the prasad frequently stir up the water? Why did he not leave it alone? 5. Why did the god decide to bring up a banana for me, an unbeliever, after my friend Balraj demanded (almost threatened) to have one? How to investigate this miracle? To have a proper investigation of this “miracle” the cooperation of the temple authorities is a must, which is impossible to come by. Assuming that permission is granted, how should one go ahead? 1. Clean up the well and its surroundings thoroughly. 2. Find out the source of the water. 3. Prevent the temple authorities from coming near the well when a devotee performs the puja. 4. Do not allow the devotees to drop anything inside the well as part of their puja. 5. Allow the prasad to pop up on its own without any kind of interventions from the temple authorities, devotees, or anybody else. After these precautions are taken, if a banana or a betel leaf still pops up, one can reasonably assume that a miracle does occur. In the absence of an investigation as detailed above, the only rational explanation possible is this: the temple authorities are conning the devotees! 1. 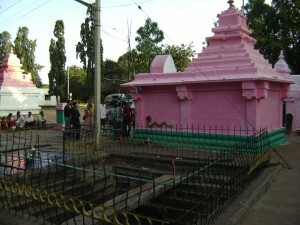 The temple authorities can dump whatever they want to inside the well before the devotees are given access to it. 2. It is also possible for the temple priest (who sits on the right side of the idol) to clandestinely drop bananas, betel leaves, flowers, etc into the well at regular intervals or whenever he wants to. 3. The articles kept next to the idol on the stone beam can also be dropped into the well unnoticed by the devotees. 4. The devotees themselves may be dropping some articles when they conduct the puja. 5. The articles thus dropped inside the well may pop up under pressure from the upward stream of the water spring inside the well. 6. 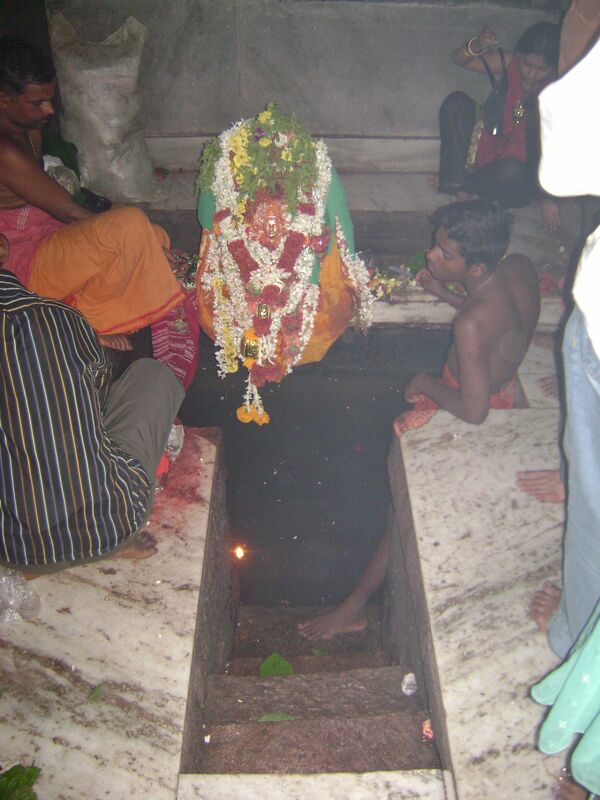 The frequent stirring of the water also helps to bring forth the articles dumped in the well. 7. The man, who hands over the articles to the devotees, picks up the items not only from the reasonably visible part of the pond but even from the dark corners of the well, including from the surface of the water just below where the temple priest sits. This enables him to fool the devotees easily. My experience in this temple only reinforces my conviction that there are no miracles in this world, only conmen and credulous devotees. I was surprised by hearing from our neighbors regarding Halurameshwara temple. To know more I visited this site. I am very thankful for your information. Now I have a doubt weather I have to visit that place or not. I suggest u to believe good and not the people. visit don’t believe others words thoughts are different. I found dipped material is found floating and keep observing others devotees gifts from pond. The authorities of Halurameshwara are swindling money out of the unsuspecting devotees, like the perpetrators of all “miracles” do. Don’t visit the spot with the intention of getting your wishes fulfilled. If you ever visit the temple, do it with a skeptical mind. Today I saw part of this program on TV9 but after reading your blog, I’m also starting thinking about TV9 credibility whether they really experienjced it or not or the temple authorities also fooled them. I don’t think TV9 reporters were fooled by the temple authorities. I feel (especially after hearing that the channel has re-telecast their story) that they are in collusion with the temple authorities in defrauding the devotees. Thanks for putting forth such a good article. I was planning to visit the temple. Now I dont think I need to travel that long to see con men swindling money. Visit to see dipped materials found floating. i.e Coin, Bangle etc are dipping material which found to floating. only Rs 20 is charged for performing puja. I want to visit the temple, “ HALU RAMESWARAM TEMPLE “ Hosadurga in Chitradurga district KARNATAKA. Present situation the “miracle” Halu Rameshwara and the Wishing-Well Happen the miracles possible in 2009 year? Yes, the temple authorities continue to defraud the devotees. That is the temple’s main source of revenue. Phew! Did I say anything that I had not experienced? What does Kiran mean by “creating bad sense to the temple and its authority..”. If it means exposing the fraudulent practices of the temple authorities, it was intended! Thank you for exposing this. Couple of days back, around 23 June 2010, I saw the documentary again on one of the Kannada channels (unfortunately dont remember the channel name) and was sure that there was some mischief being played. The TV channels are guilty of misguiding the common man and making them believe these con men. “Miracle” alone can make these TV channels act responsible. There was also a large bull statue here made of emerald which has turned black over centuries. Recently, when it was discovered that the black thing is indeed emerald, it was stolen. There are many things happen around us which usually can not be explained with logic. I havent seen the documentary nor visited the place. Looking fwd to get the 1st hand exp to have an un biased conclusion. I wish to bring to your notice that kindly do not look at this temple with a prejudice. I do not know the situation now, however, i can assure you that i had visited this quite a long time back say about 12-15 years back, when there was no interference by the temple pujari (a very pious brahmana), the devotees would take bath and then sit on the pavement at different corners after offering worship to gangamma (the deity placed above the pond on a stone slab). I saw my grandma waiting for more than an hour to find the answer for her question (praying intensely within) and then suddenly a cup of curd rice rising towards her in the pond water. On another question regarding her son’s employment, she got a banana pierced with a number of 50 paise coins, which i vividly remember even today. the result was her son got employment within a month. It is wrongly being called as a wish fulfilling pond, it is a pond where we pray to know whether a desire (or a problem) would be fufilled (solved) or not. 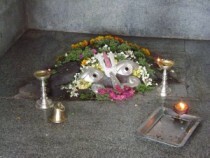 Many get bilva leaf indicating that one should worship Lord Shiva to overcome the obstacle and the result (say marriage)will definitely be delayed. And some wait indefinitely for one full day with out any response indicating that their desire would never be fulfilled (which happened to my aunt- her daughter remained unmarried). As regards, investigation , plz know that such futile efforts were carried out many times only to be hushed up with out any tangible result. True, my knowledge of Indian mythological characters is very limited. I thank Umesh for pointing out this glaring error, or better, blunder. Though I am bit familiar with the mythological being Kamadhenu, I had absolutely no idea who she was depicted in Indian art. Had I known that the image was that of Kamadhenu, I would have done some reading before making that comments. 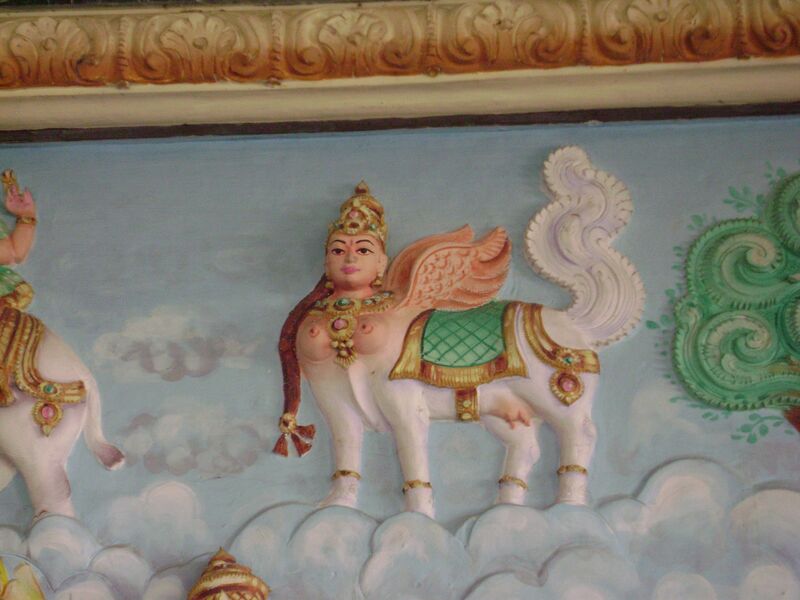 But is it the only way Kamadhenu is depicted in Indian art? I made a google search after reading Umesh well deserved criticism. Wikipedia article on Kamadhenu has, for instance, a number of images depicting her in different ways. 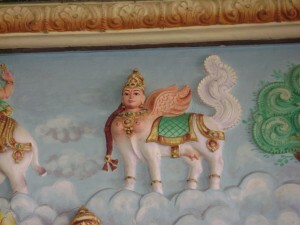 Kamadhenu is glorified by the majority of the Indian artists with 2 feathers, 1 normal tail and another of a peacock, half lady in the front. There are simple illustrations on the net & wikipedia is certainly not the authority, however i feel you can always edit your posting and delete my comments too…. I feel that one can always troll the internet when they are bored. Indian artists can decide for themselves how they would like to reinterpret inherited mythological and folk motifs, and can do very well without any hand-holding or hand-tying from those who wish to ossify these motifs and taboo their reimagining. the details which you have given about this temple are really good, and the photographs are also good. but the comments which you have made about the blessings of the goddess ganga are quite wrong. as we hall know that there is some unseen force is present on the earth which we all call as GOD in different names in different religions. but you know most of the people never get any prasad eventhough they sit for hours. when i visited this temple in the month of April 2012 a newly married couple got it, and myself and my husband got banana bangles and flowers. the important point is that i got this prasad for the first time in my life in 40 yrs. I faced many problems in my life, whenever i go i used sit for hours together but never be blessed with any prasad. it was the indication that i need to wait for more years to settle in my life. in front of me only many used to come and sit and were blessed with one or the other things as prasadam, i dint get it. one more thing. if some thing bad is going to happen then u will get the indication there. my mom told me when she was young girl her relative got rice with black thill and they died in 3 months. when i went for first time, my grand ma & pa were praying for a grand son as they already got grand daughters, they blessed with coconut, and from that day onwards they got prospered like anything with male children vehicle, building, business, and many more. they became one of the rich family in the town. on the same day of my first visit i saw a couple who got metal bangales, i dint know that they are gold or not as i was very young 8 yrs only. so finally i think everything on the earth stands on the belief and trust only. if we look at the thing in a positive way we get positive results only. i dint get any blessings for 40 yrs but i never stopped praying, finally i got blessed. so INTAZAAR KA PHAL MEETA HOTAHAI. Recenly I visited this temple. The articles popping out is the real miracle. All the negative informations what you have sighted is due to your negative thoughts. I have witnessed it, so many people got banana,curd rice bettle levaves etc. Please read the reply given by Mrs.Shashikala, as she has rightly quoted, some people waiting for whole day also nothing will popout from the well. but for few people within minutes the articles will popout from the well. If you dont have faith in that ,just levae it like that dont spread the wrong information due to your frustration. Just think that how this is working,i.e the articles are emerging out of the well, because All the newton Law of gravity no more holds good here. If you are a science student you understand this. Else you just try to make coin float in the bucket of water. Then I hope you understand power of god behind it. 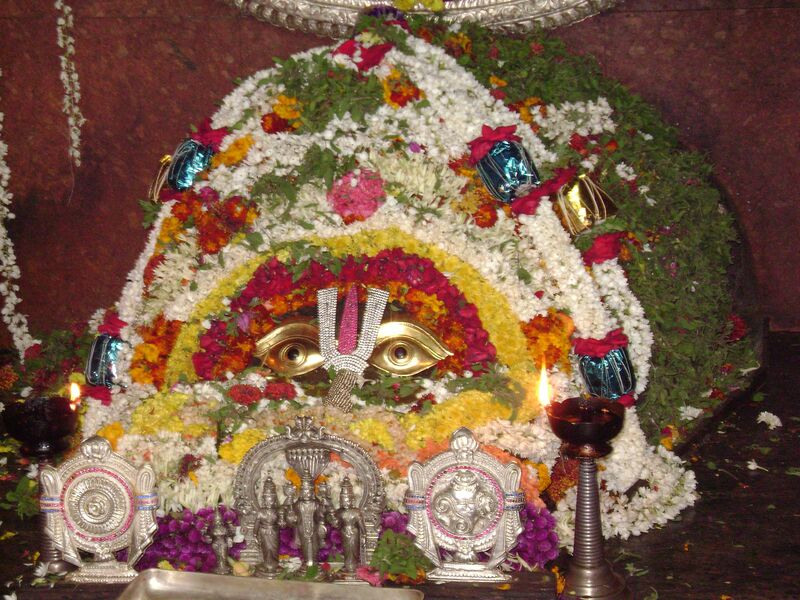 To all readers I recomond that if you are in chitradurga ,please visit the temple. Thanks for all the readers. Hi am a frequent visitor to this temple sorry for this question. I received hombale once n many times I have received betel leaves and ya I evn received dry fruits so n once wen I had been there 1 lady got small ladder and as soon as the priest gave her one person came n informed her that her husband passed so wat will you tell for this. The worst thng is even am in a confusion am not telling your wrong but I want some proof which says this is fake. curd rice popping out of water !!! Simply out of the senses. For this to happen, logically..
1. rice to be cooked(below, inside the water). 2. prepare curd out of milk. 3. mix the rice and curd, maybe along with some dry fruits, grapes, pomegranate,..
5. push it against gravity to pop-up. (curd rice in a cup will submerge in water). I really think, the persons FOR this miracle are not devotees, but seem to be promoters / agents of this con team. Everybody knows the integrity of some tv channels who get a lot of money from such programs. Even when I came to know about this temple, I also thought in the same of yours. But just make it clear I visited the temple, then I realized that the fact of articles popping out from pond is real and I witnessed it. This particular place is hardly 250 km from Bangalore. You can go and check the reality. I visited this temple on Sunday and got hombale, bangle, turmeric, full coconut, cradle (silver), a full banana (partially peeled), thick turmeric thread, all these things came up at once and the priest said it was the biggest gift that anybody got!!! so isn’t it a miracle ? why didn’t the silver cradle float earlier, but came up after I prayed for a few minutes ? I went to this place twice with my parents very long ago may be 15 yrs back. My father got silver cradle with banana first time, I didn’t see properly how it happened and all. But second time I went, I was curious about the miracle and I just was wishing along with my mother and friends, I didn’t wished any thing particularly but I was wishing some thing good for myself, one of my friend got curd rice but as you mentioned Pujari gave it to her, but I saw a pair of banana from the deep water and that time nobody was disturbing water, I shouted to Pujari there is banana, but nobody could see it every one asked where where? Then I lifted it from my hand then only they could see and it was pair of similar bananas, it wasn’t rotten it was in good condition, Pujari said its very positive thing, some women said I will have 2 similar kids in future, I have 2 boys now May be coincidence or true but it was really refreshing. I can’t forget the whole scenario. I was visited this place on 15 January 2017.I was really b amazing that many people are getting Prasada from the water. I also sat on the pavement by praying to fullfill my wishes nothing will pop up from water for 20 minutes I was decided to leave the place but immediately I got a piece of ripped banana I was happy but I have to wait and I believe in this. Who have believe in the god they will get good things those who doesn’t believe plz stay back (one request plz don’t comment negative words ab the temple ) gangama is the purest & truth god. .
Will Astrologer Bhaskar Shetty Keep His Word And Take Up The Rationalists' Astrology Challenge?